Evaluate size – Large (>0.5mm) vs Small (<0.5mm). Some patients will have slight differences in the size of their pupils (anisocoria). Evaluate shape – Miosis (constriction) vs Mydriasis (dilation). Mydriasis can be seen in a variety of conditions, including from drugs, acute glaucoma, and CNS disease (esp if fixed). If evidence of miosis, evaluate for Horner’s syndrome by checking for ptosis (drooping upper eyelid) and anhidrosis (diminished sweating). Evaluate reaction to light – Tell the patient to look at an object in the distance and shine light in eye to test the direct (same eye) and indirect (opposite eye) response (constriction). Abnormalities in pupillary response to light can be seen in drugs, Argyll Robertson pupils, optic nerve damage, and CNS disease. After turning on, test the light on your forearm. Use the small diameter light for constricted pupils and the larger diameter light for dilated pupils. Use the focusing wheel located on the side of the instrument to make your view as clear as possible. Patients should then be examined in a darkened room with the examiner using the same eye to view through the instrument as the eye on the patient that is being examined. Change the light source to the red reflex and use the blood vessels visualized to guide you to the patient’s optic disc. 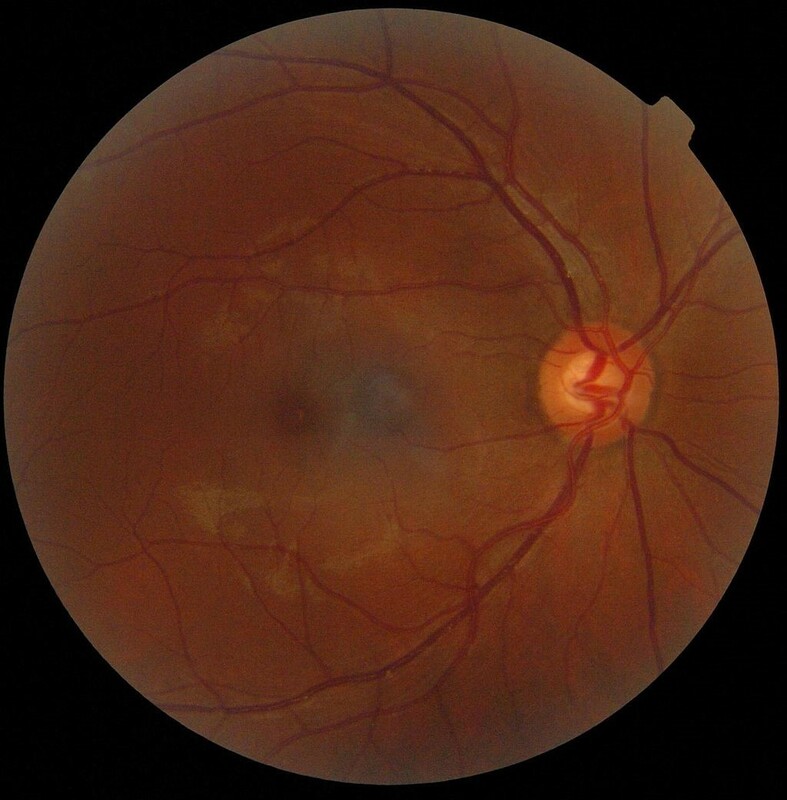 Check the blood vessels, fundus, macula, and fovea for pathology. Repeat the procedure for the other eye.